As a reporter for the last 10 years, I’ve often covered a lot of home makeover type of stories. However, even after writing about these topics for so many years, when it came to doing my own home project, I still faced many of the challenges and stressors that all homeowners face. One part of our journey to building a new addition that was not stressful, though, was working with Colonial Marble. I’ve written about the company for years and they were an easy choice when it came time to select a countertop for our new bathroom vanity. Everything- from the experience in the showroom, to the actual installation- went smoothly. I was impressed from start to finish, as I’ve often heard other homeowners say when I’ve written their stories. 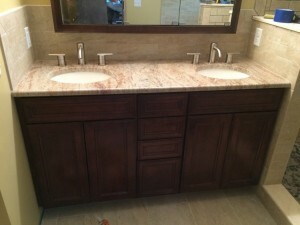 We are very pleased with how the granite countertop completes the look of our bathroom. It blends seamlessly with the color and look of the space! This was a two-story addition built by Footprints Builders & Renovators LLC. All of the finish work was completed by my husband (who has experience having worked for a general contractor for many years in a past life). The upper level of the addition is a master bedroom, master walk-in closet, and master bath. The lower level of the addition are our new home offices and conference room.